ProbioSlim is a weight loss supplement that claims to combine cutting edge probiotics and prebiotics with groundbreaking weight loss supplement ingredients to help you improve digestion, lose weight, and become a healthier you. But does ProbioSlim really work? Our team of weight loss enthusiasts are dedicated to bringing our readers only the best reviews - scouring the weight loss supplement world for new products to review according to our three-part ranking criteria of 1) scientific backing, 2) quality of company from which the product originates, and 3) customer reviews. So let’s take a closer look at ProbioSlim. ProbioSlim is brought to you by a company that has the same name as its product - ProbioSlim LLC. Unfortunately, upon searching for their contact information we were unable to find a specific address - only that the company has offices all over the world in the US, UK, Canada, and Australia. Despite being able to locate a telephone number and Facebook page, the fact that there is no physical address provided makes us a bit wary of the company behind this product. As mentioned earlier, ProbioSlim incorporates probiotics - a group of bacteria found in the digestive system responsible for the breakdown of food particles and the reduction of constipation, bloating, diarrhea, etc. - as well as prebiotics, essentially the foodsource of probiotics. Additionally, ProbioSlim contains green tea extract, a metabolism booster necessary to accelerate fat burn and give the consumer much more energy. However, although this in theory sounds nice, the most important question to be answered is: does it work? 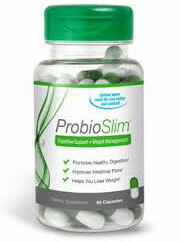 Unfortunately, ProbioSlim uses a probiotic ingredient, LactoSpore (also known as Bacillus Coagulans), of which ProbioSlim LLC claims to be far superior than its competitors and its “X Factor” so to speak. However, our team has uncovered several conflicting reports in this regard. WebMD - a very reliable source - states there is simply not enough evidence proving whether this ingredient is anywhere near effective or not, and furthermore the FDA has not recognized Bacillus Coagulans as GRAS (or Generally Recognized as Safe). Plus, ProbioSlim fails to list its ingredient proportions and this is of major concern seeing as side effects and effectiveness are based not just on the ingredients themselves but the amounts of them present in any given product. However, due to ProbioSlim’s proprietary blend they are not required to show their numbers and this is a major red flag for our investigative team. Lastly, ProbioSlim is quite expensive seeing as a 60 capsule bottle runs about $70, not to mention the product also incorporates an automatic renewal billing system. Although it may appear that probiotics are the hot topic right now, let one thing be known: not all probiotic supplements are created equally. And in ProbioSlim’s case, there is simply not enough evidence pointing to the effectiveness of LactoSpore, ProbioSlim’s main component. Thus LactoSpore should be avoided for human consumption unless you have spoken to and are in close contact with a medical professional. Moreover, the product is expensive, the company elusive, and the billing system - also known as the VIP Membership Program - fully automated. Therefore in our opinion consumers should only take probiotic supplements deemed safe by major medical websites and sold under good business practices with all of the necessary contact information made easily available. Unfortunately in this regard, ProbioSlim comes up short. Bottom Line: ProbioSlim is not backed by any medical evidence, sells for quite an expensive price, and comes from a business that isn’t the most forthcoming with its contact information - therefore proceed with caution. I ordered the free sample.....not realizing I had to cancel future shipments before a certain date. the rep "sold" me the shipment for a reduced price and cancelled my future commitment. However the product gave me a sever bacterial infection. I suffered for 2 weeks with severe flu symptoms, muscle aches so severe my skin hurt, joint swelling, head aches. Blood tests only revealed high bacteria activity. SO be very careful taking this product. I started with a probiotic recommend at my healthfood store and suffered no ill effects. I had already decided to cancel my direct shipments of this product before reading several of the reviews. I called and talked to a representative named Nathan, and when I told him that I wanted to cancel just because I didn't feel that the product worked well for me and I believed that it made my digestion worse, he did not argue, try to sell me anything else or become rude in any way. He told me that he cancelled the order, and I would not receive any more shipments or billing. I hope that both are true, and I am finished taking the product. I found that as with all other "easy" weight loss, this was "easy" but also didn't really work.